How can I sign up for the race? Headphones are allowed for any runner who is not competing for a cash prize; however, we strongly encourage participants to abstain from using headphones during this race. If I have a child participating in the Kids Kilometer, will I be able to run with them? Yes, adults may accompany a child during the Kids Kilometer but must be registered for the 5K, Half Marathon, or a Guardian Bib in order to be allowed on the course. The adult must wear their respective bib to enter the course, and each child is limited to one guardian. Guardian bibs are free and can be added to your child’s registration during the online registration process or at the Sports & Fitness Expo at the Solutions Booth. If you choose not to run with your child, there will be a secure corral at the finish line where you will meet up with your child after their race. Learn more about deferring your race entry HERE. J&A Racing does not process refunds. NO EXCEPTIONS. For details on the Registration Fee Reimbursement Plan, click here. There are two options for transferring your current race registration to another person. Click here for details. There are many fun things to do during race weekend. Click here to find activities. What will the weather be like in Hampton during October? The average high is 70 degrees and the average low is 52 degrees during October. What are the time limits for the races? Are the races walker friendly? Yes, we will have plenty of participants who will walk. The 13.1 mile course will be open for 4 hours, which equates to a 18:19 minute per mile pace. Participants on the 5K course must maintain a 20 minute per mile pace. You must be 12 years of age to run the Half Marathon. We encourage participants of all ages to join us for the 5K. (Parents or guardians are encouraged to run with their minor children but must be registered for the race. Responsible adult family members must be present at the finish to receive their minor children as there will be no additional security beyond the secured finisher’s area, and no specific parent/child reunion area.) The Kids Kilomter is limited to children 12 and under. Please bring your race number with you to the post-race party as that is your ticket for food and beer. For a fee of $25, we can mail you your packet. Please click on this option during registration. If you are already registered and would like to add it to your registration, please click here. The packet mailing option will close on September 3, 2018. Packets will be mailed out the week of September 19th. We will NOT have race day registration. If the race has not sold out, we will have registration for the Half Marathon, 5K, and Kids Kilometer at the Expo the day before the event during packet pick-up. We will accept cash or credit cards during Expo registration. Where is the Hampton Roads Convention Center? Yes. If you are unable to pick up your own race packet, you may authorize another person to pick up your packet/bib number. The authorized individual MUST have their own photo ID, a signed and printed authorization form, and a copy of the participant’s photo ID. The signed authorization form MUST be printed, we will NOT accept any authorization via phone, text message, or any other electronic device. The copy of the photo ID may be via text, email, or photo copy. If the authorized individual is missing any of these items, we will not release the packet/bib number, NO EXCEPTIONS. CLICK HERE for the authorization form. You must pick up your race packet prior to the event. If you are 16 or older, you must have your ID to pick up your race number – NO EXCEPTIONS. CLICK HERE for information on packet pick-up. If you cannot pick up your packet during the Expo hours and do not have someone else that can pick it up for you, for a fee of $25, we can mail you your packet. Please click on this option during registration. If you are already registered and would like to add it to your registration, please click here. The packet mailing option will close September 3 at 11:59PM. Packets will be mailed out the week of September 19th. Where will my results be posted? Do you have runner tracking? Results can be found HERE after the race. We will provide live Athlete Updates for the Half Marathon, 5K and Kids Kilometer. You can sign up via the website once the first round of Bib Numbers are assigned (mid-September). No, awards will be mailed to all recipients after the event. Click here for a complete listing of the overall and age group awards. Are the Courses Certified by USATF? Yes. Click here for more information about Pace Groups. 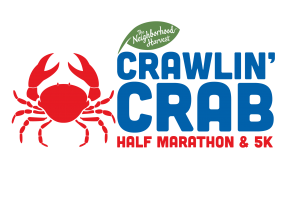 You will need a wrist bracelet provided by the Crawlin’ Crab Half Marathon and 5K in order to drink beer at the post-race party. You can get this bracelet by showing us your ID at the Expo (at the special ID Check booth) or at the post-race party. Registered Half Marathon participants (ages 21 and over) get 4 free craft beers and 5K participants (ages 21 and over) get 2 free craft beers at the post-race party. Beer will also be available for purchase for spectators or runners. All beer sales proceeds go to the Noblemen. Yes, there will be plenty of space to view your runner finish in front of the Convention Center. We also invite you to stay and enjoy the post-race party. View road closure information HERE. We encourage all participants and spectators to arrive prior to 7:00am to ensure parking availability and allow for adequate time to drop off bags, warm up, and get to the start corrals. Yes, we will have a dry bag check for the Half Marathon and the 5K. Bags must be picked up immediately following your race in the same area you drop your bag off. You MUST use the clear bag you receive at packet pick-up. For security reasons, no other bags will be accepted. We WILL NOT accept any other bags. All Half Marathon and 5K bibs will include a gear check tag that will need to be removed from your bib and tied to the bag before you turn it into gear check on race morning. J&A Racing is not responsible for any lost items, so please do not leave valuables in your dry bag. What are the event start dates and times? What are the pace times for each corral? Check back for a list of corrals and predicted finish times. All parking lots adjacent to the Hampton Roads Convention Center will be available for parking. Will there be Gatorade and energy gels on the course? There will be Gatorade Endurance Formula, lemon lime flavor, at all water stops. Energy Gels will be handed out in a variety of flavors on the course for the half marathon. Make sure you train with them if you plan on using them on race day. Yes, there will be water stops approximately every 2 miles on the course.